Core characters are Gemma Doyle, distant relative of the esteemed author, co-owner of the Sherlock Holmes Bookshop and Emporium, and partner in the adjoining Mrs. Hudson’s Tea Room. Gemma, like Holmes, has almost freakish powers of observation and deduction, but unlike Holmes, often is too clever for her own good. Though she has an eye for detail and what appears to be a photographic memory, she’s oblivious in many ways. There were times I found Gemma to be grating. Gemma’s Great Uncle Arthur, world traveler and bookstore Co-owner and tearoom partner. I look forward to more of Uncle Arthur, his character sound fascinating. Mrs. Hudson Tea Room partner, Jayne, Gemma’s best friend. Ryan Ashburton, West London (Cape Cod) police detective and Gemma’s former lover. Det. Estrada, Ryan’s partner. Det. Estrada’s immediate dislike of Gemma and her single-minded determination to focus on her was irritating. She wanted so badly for Gemma to be guilty. There doesn’t appear to be a reason other than her disbelief of Gemma’s “ability”. Moriarty, the bookstore cat. He’s not a fan of Gemma. 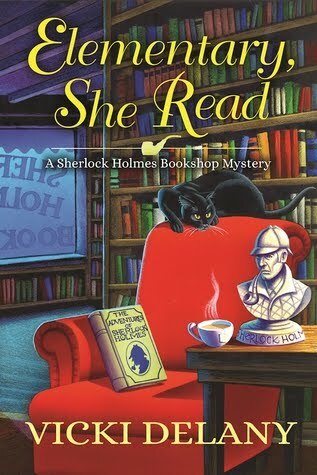 When Gemma finds what appears to be a rare, therefore expensive, magazine hidden in her bookstore, tracking down the author leads to a body; leading to Gemma and Jayne as prime suspects in a murder. For habitual, astute mystery readers the difficulty level will be low, but the writing combined with the appeal of the setting and characters should make up for that. ELEMENTARY, SHE READ shows real promise. There are a few things that would make the series a definite go to for me. 1. Less contradiction and a trifle more humility in Gemma. 2. An explanation for Det. Estrada’s hostility. She had it out for Gemma from the get go. Difficulty believing in Gemma’s “ability” doesn’t cut it by the end of the book. Speaking personally, these changes would certainly make Gemma and crew my newest gotta read cozy series.